We are one of the leading wholesalers and suppliers of a comprehensive range of digital capacitance meter. Our range finds application in electrical, electronics, construction and furniture. All the products offered by us are procured from one of the leading vendors and manufacturers based in various parts of the country. 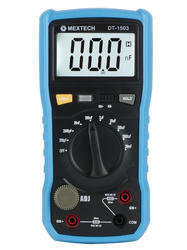 We offer a wide range of Digital Capacitance Meters DT1503, which finds application in various industry applications. In order to maintain the quality standards, we acquire our rods from well known manufacturers and suppliers. Moreover, these can be customized as per the specific requirements of our clients. This is a 3½ Digits Digital Capacitance Meter. Suitable for factories, Laboratories, Schools & Research Institutes and other Use. Zero Adjustment knob for all Ranges. Power Supply: 1x9 Volt Battery. Display Size : 64 X 35 mm. Unit Size : 185 X 90 X 53 mm. Accessories: Instruction Manual, One Set Test Leads, 1pc 9V Battery.